Oh hello friends! 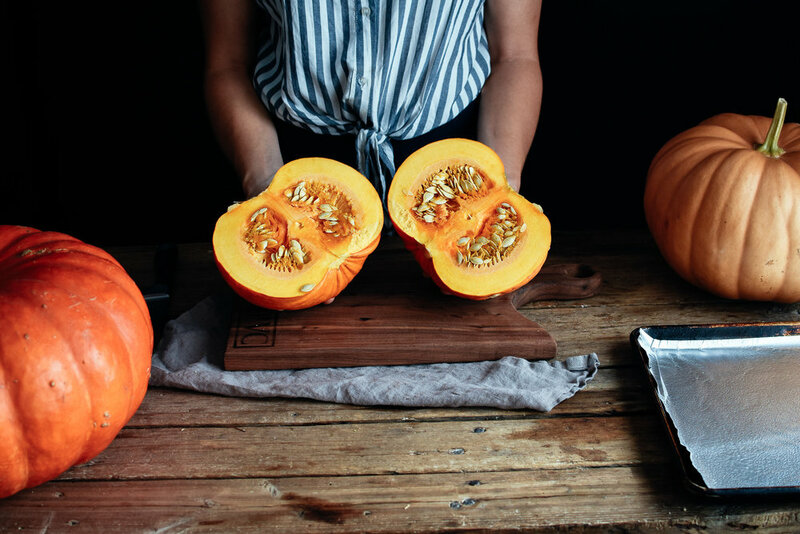 Today we’re talking about all things pumpkin! Living on a pumpkin farm means that I didn’t even understand that you could buy pumpkin in a can until I was an adult. Ha! My mom always cooked up a bunch of puree every Fall, and would put it in the freezer in 2 cup portions, so that we could easily pull it out all Winter long. The good news is that it’s ridiculously easy to make! 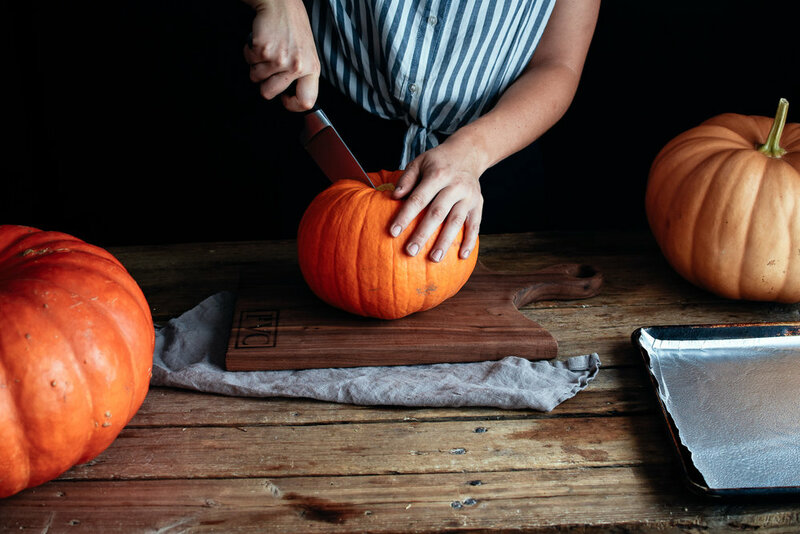 Honestly the hardest part about it is cutting the pumpkin open, especially if you have a large one. 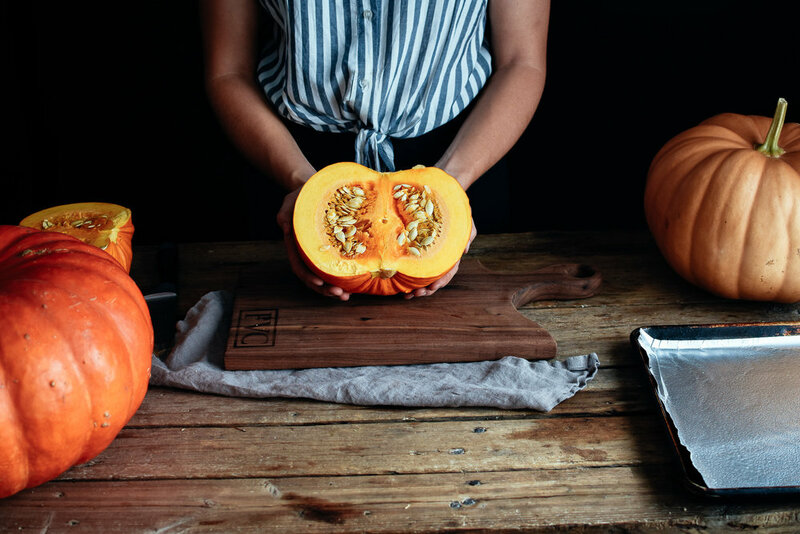 So many specialty pumpkins taste amazing, and some are actually a type of squash! Porcelain Doll, Blue Doll, Queensland Blue, Jarrahdale, Autumn Buckskin, Peanut Pumpkins, Cinderella, Sugar, and Baby Pam are just a few that we grow and that make sweet, creamy puree! I prefer something smaller like Sugar if I just want one serving of puree for a recipe, but I’ll go with one of the larger varieties when cooking up a big batch for the freezer. I love that they both decorate my house, and then are eaten. That’s a win win. Preheat your oven to 375 degrees F. Line a large baking sheet with tinfoil, grease with cooking spray or butter, and set aside. Wash the pumpkin thoroughly and dry it before starting. Use a large knife to cut it in half. I will often stick the point of the knife in the top, pointing down to the table, and then slowly pull it down. Repeat on the other side to completely cut the pumpkin in half. 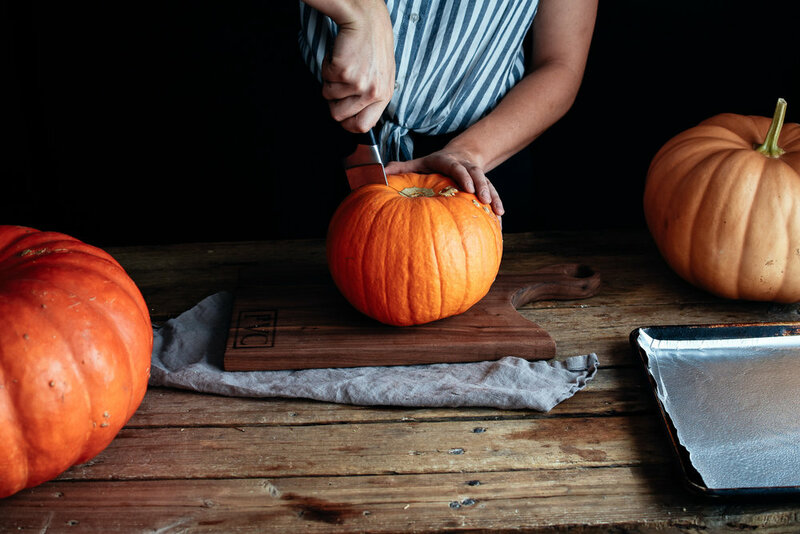 Depending on the size of your pumpkin, cut into quarters, or again into eighths. Use a spoon to scrape along the center, pulling out the seeds and stringy bits in the middle. Keep the seeds for later if you want to roast them! 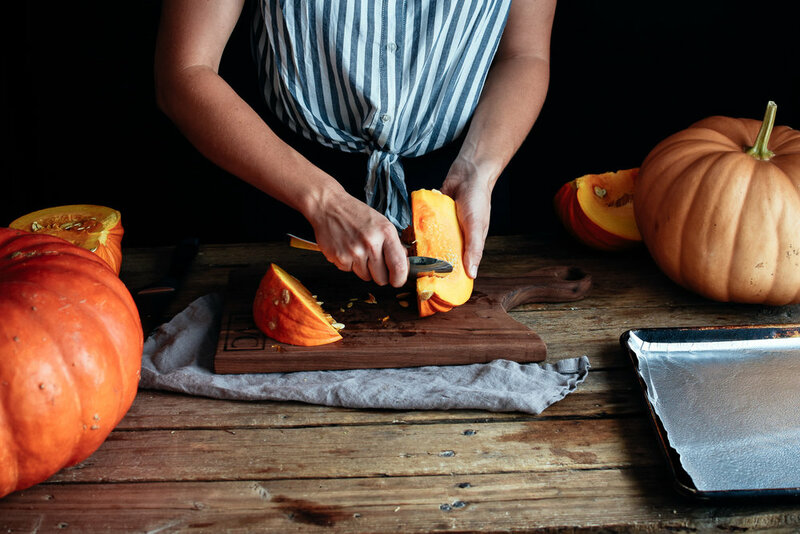 For very large pumpkins, you may want to cut the slices down even more. Each slice shouldn’t be much wider than your hand - otherwise it will take longer to cook. Try to keep the slices fairly even, so that they will be done at the same time. Place flesh down onto the prepared pan, and roast in the oven for 45-60 minutes. 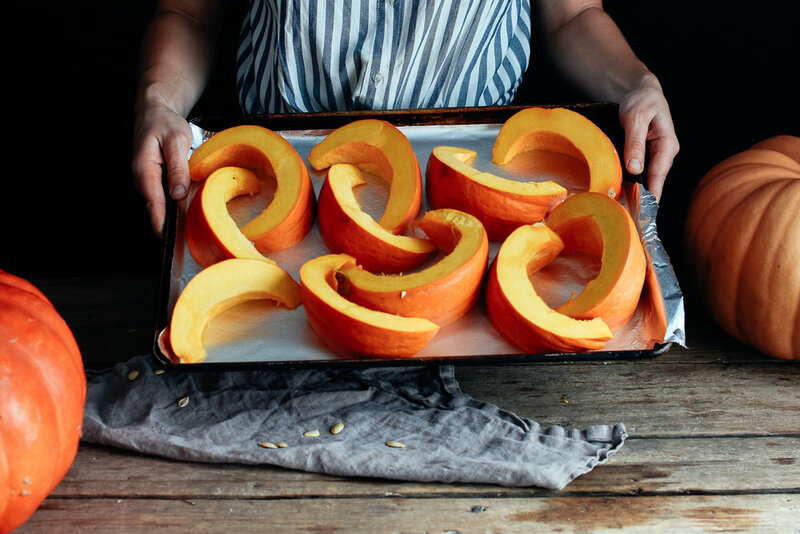 Flip the pumpkin slices a couple times while roasting, keeping the flesh side down. 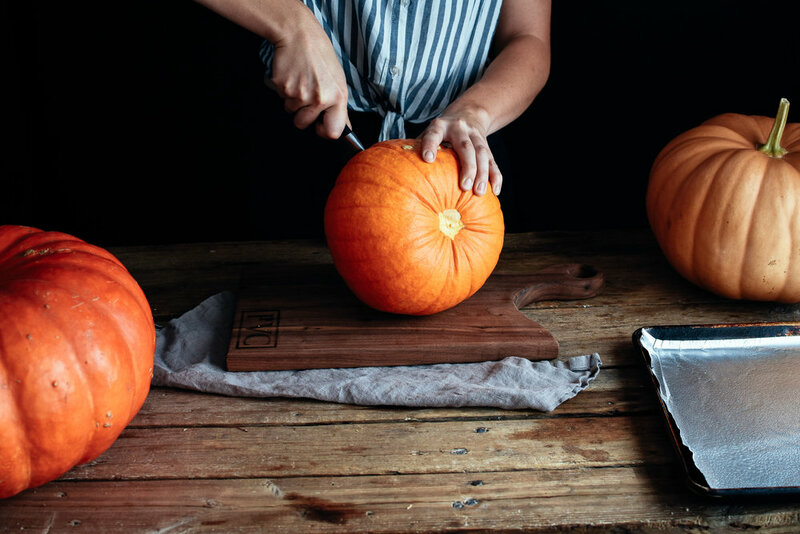 The pumpkin is done when a fork easily pierces the flesh - if in doubt, leave it in for a bit longer! Remove from the oven when done, and allow to cool for 10-15 minutes before handling again. Use a spoon to scrape along the rind, scooping all of the flesh out. 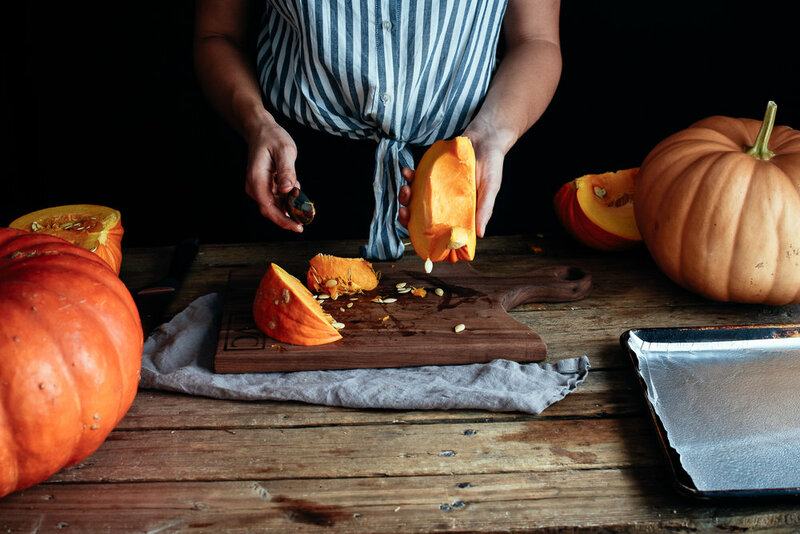 Throw all of the pumpkin flesh into a blender or food processor, and blend until smooth. You may need to scrape down the sides and give it a stir before blending again. 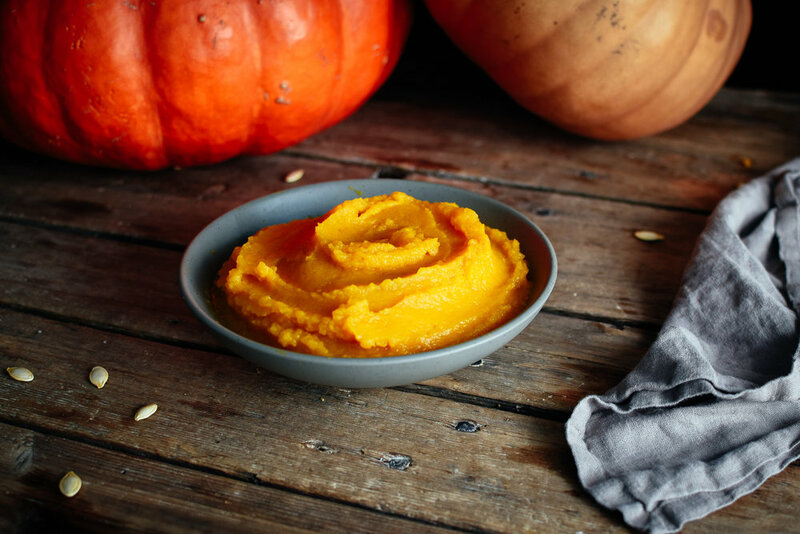 You should have smooth and creamy puree that is ready to be used in any pumpkin recipe your heart desires! Store in the fridge for a few days if you’re going to use it immediately. Or, simply freeze it in 1 or 2 cup increments (label and date your containers!) for future use. It freezes extremely well! 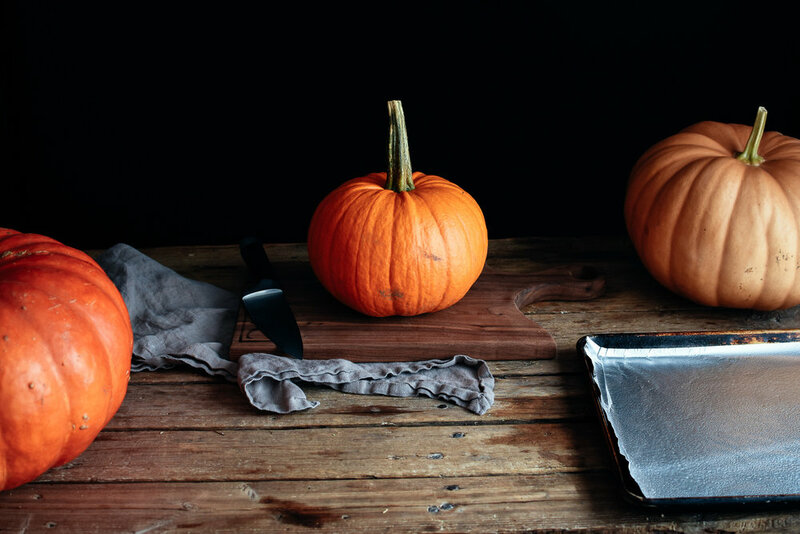 Certain pumpkins may be more water-y than others. If you notice your puree is quite thin, or has liquid settling on top, simply place it in a very fine, mesh, sieve over top of a bowl, and let it sit for at least half an hour to drain away a bit of the liquid! 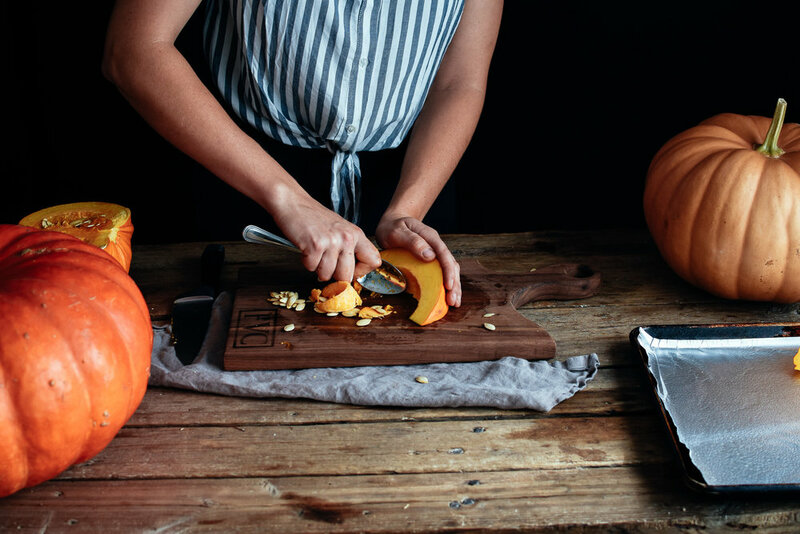 The colour of your puree will vary slightly with the type of pumpkin you use, as the different types have varying colour saturations! 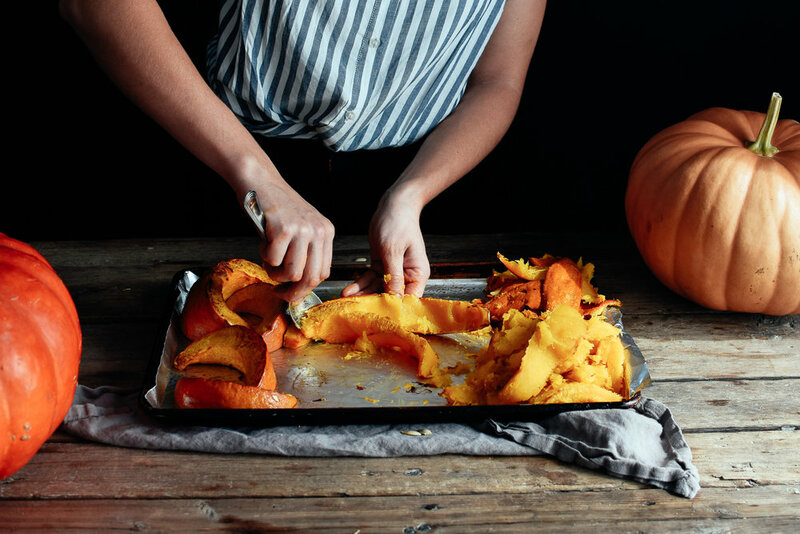 pumpkin recipes to make with your fresh pumpkin puree!